Western blot analysis of various extracts using TBP (D5C9H) XP® Rabbit mAb (HRP Conjugate). 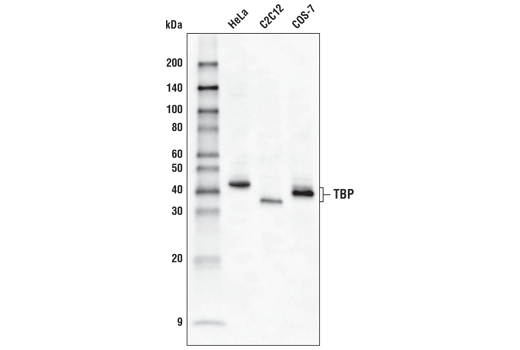 TBP (D5C9H) XP® Rabbit mAb (HRP Conjugate) recognizes endogenous levels of total TBP protein. Monoclonal antibody is produced by immunizing animals with a synthetic peptide corresponding to residues near the amino terminus of human TBP protein. This Cell Signaling Technology antibody is conjugated to the carbohydrate groups of horseradish peroxidase (HRP) via its amine groups. The HRP conjugated antibody is expected to exhibit the same species cross-reactivity as the unconjugated TBP (D5C9H) XP® Rabbit mAb #44059. TATA-binding protein (TBP) is a ubiquitously expressed nuclear protein that functions at the core of the general transcription factor protein complex TFIID (1-3). TFIID, which contains TBP and 13 TBP-associated factors (TAFs), contributes to the formation of the transcription pre-initiation complex, an assembly of multiple protein complexes (TFIIA, TFIIB, TFIIE, TFIIF, TFIIH, and RNA polymerase II) that bind to a gene promoter during the initiation of transcription (1-3). Once the pre-initiation complex is formed, RNA polymerase II becomes competent for elongation and transcribes the body of a gene. TBP functions in the recruitment of TFIID by binding to the TATA-box sequence found approximately 25 base pairs upstream of the transcription start site of many protein-coding genes. In addition, many transcriptional activator proteins interact with TBP and various TAF proteins to facilitate recruitment of TFIID and formation of the pre-initiation complex. Goodrich, J.A. and Tjian, R. (1994) Curr Opin Cell Biol 6, 403-9. Berk, A.J. (2000) Cell 103, 5-8. Thomas, M.C. and Chiang, C.M. (2006) Crit Rev Biochem Mol Biol 41, 105-78.